Franklin Evans drops viewers into his own weird wonderland. Once you’re down the rabbit hole, you may be as awed and dismayed as Alice herself. Evans has two shows up now, at Montserrat College of Art Gallery and Steven Zevitas Gallery. Walk into his installation at Montserrat, and it’s like stepping inside a painting. Colors and lines are everywhere: on walls, on the ceiling and floor; in corridors of vertical strips of colored tape. The same is true, on a more modest scale, at Zevitas. It’s breathtaking, and daunting. With his hues and gestures, with his art-history references, the artist solidly places us within the rubric of painting. But with most paintings, the viewer regards a discrete object. This one swallows us up. It is much bigger than us, but there are tiny things in it, such as texts too small to read. The effect discombobulates. Evans engulfs us in his process, too. He starts with writings by minimalist icon Donald Judd, who was a critic attuned to technique. Snippets of Judd’s reviews appear throughout both shows, and provide launching points for Evans’s painterly meditations. For instance, Judd describes in detail an abstract work of squares within squares, orange at the center and gray on the edges. High on one wall at Montserrat, Evans has a painting that fits that description. 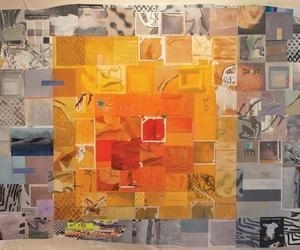 At Zevitas, several discrete paintings, all on unstretched canvas, accompany the installation, and in one, “circumjacentoffsetloweredgeredorangeochergray,” the same color scheme arises in a jittery patchwork of images. Although painted, they look photocopied or scanned, groggily blinking with references to artists such as Matisse and Sigmar Polke. The installations, too, roil with art-history rumination. We’re not just inside Evans’s painting, we’re inside his imagination, which roams compulsively from his childhood to his art idols to naked people, and more. The artist searches the Internet for images of his paintings, or those of others, and prints them out, no matter the quality. He recycles pictures of previous installations. In his paintings, he may start with a small reproduction of a fraction of a painting by, say, Polke (“polkedots,” at Zevitas). He’ll zoom in and reproduce repeatedly, then paint what he sees. In the paintings, the result is clever and visually exciting, but half-chewed, as if Evans hasn’t quite integrated his art-history lessons. The installations, while brimming with historical imagery, crackle with originality. They demonstrate how one man’s overflowing mind reflects two great rushing rivers of culture — art history and the whitewater of the Internet.